Local governments are the largest industry in the world without an r + d function. What happens if you create an informal r + d unit for a city, bringing together a carefully chosen group of people who are doing great but very different things in the world to re-imagine issues of civic importance where things have ceased to function as one would hope? If the atmosphere is fun, collaborative and engaging, oriented towards ‘doing’ rather than listening, can new, innovative ideas be generated that could improve the health of the places we live? A few weeks ago Public Workshop created a Near Future City Think Tank, thoughtfully assembling an incredibly diverse cast of nineteen people who are doing great things (see below) to rethink how we engage citizens in the making of their public spaces, with a particular focus on Waller Creek in Austin, Texas. Let’s face it folks, our public planning processes are largely broken. Nobody wants to fill out another questionaire, place a dot on a map or attend another boring or rancorous community meeting. And it shows. At recent public space planning meetings in Austin (in this case regarding Waller Creek), I could count the number of non-City employees on one hand….with fingers to spare. And this problem is not limited to Austin but is endemic to planning processes nationwide. The many reasons for this problem are intimately tied to the tools, strategies and attitudes that are applied to planning processes…..to be discussed in more detail at another date (you can find a few of my thoughts on the matter by clicking here). What happened at the Think Tank? Using the work of Waller Creek Is For Lovers (here) and others as a starting point, how can we further use Waller Creek as the test bed for more directly engaging people in the making of their public spaces? 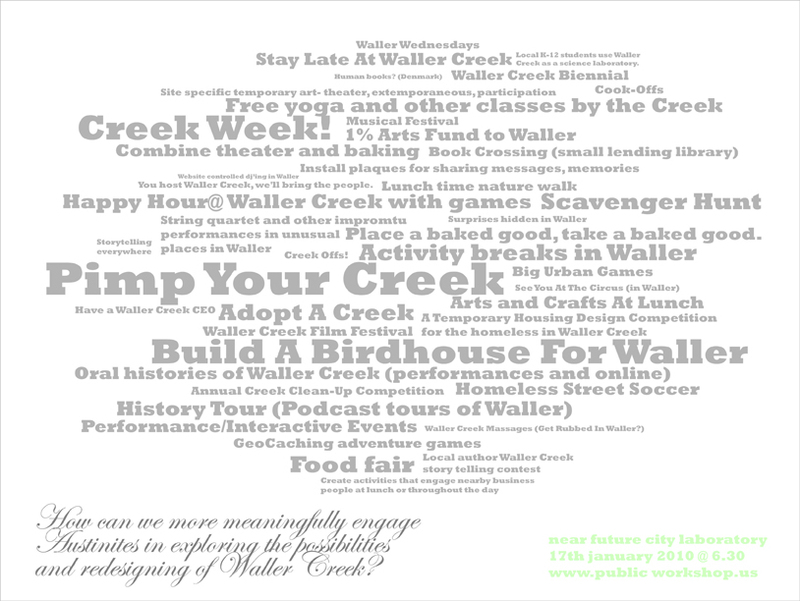 What would it look like if we invited a city’s people, its cultural and social institutions to stage events, create interventions or simply do things in and related to Waller Creek that celebrated their talents or culture? 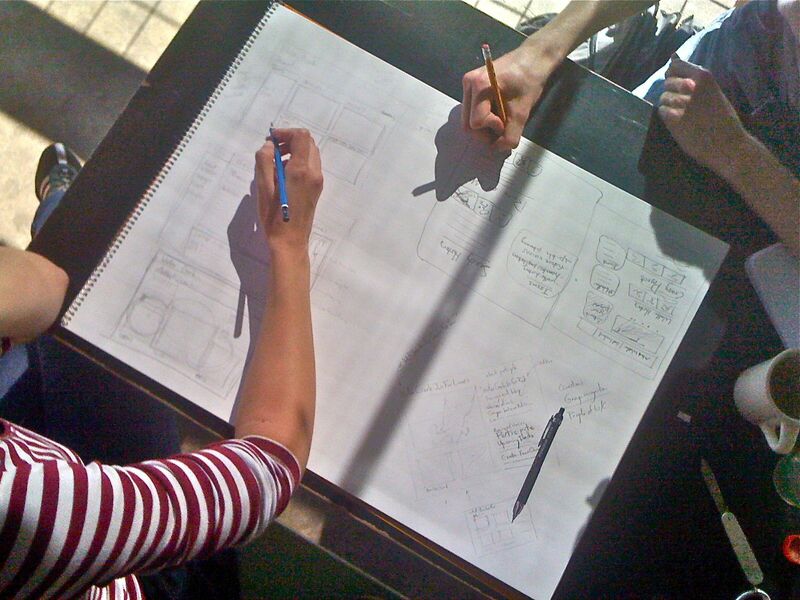 How can new mobile and web based technologies support or even bolster these endeavors? How can technology support the insertion of story, ‘doing’ and experience into the planning process? And what analog systems are necessary to make technologies ‘stick’ or be useful? Interested in what the brain-trust came up with in just 60 short minutes? Have a look. We are proceeding with exploring the development of an exemplary event that will showcase how Austin can better engage its citizens and cultural community in the making of great public spaces. Simultaneously we are exploring possibilities for developing a web and new social media platform that will support such a fantastic collection of explorations, experiences and events. Will it be Creek Week? A Week Of Waller? A Shoal Creek Vs. Waller Creek-Creek Off? 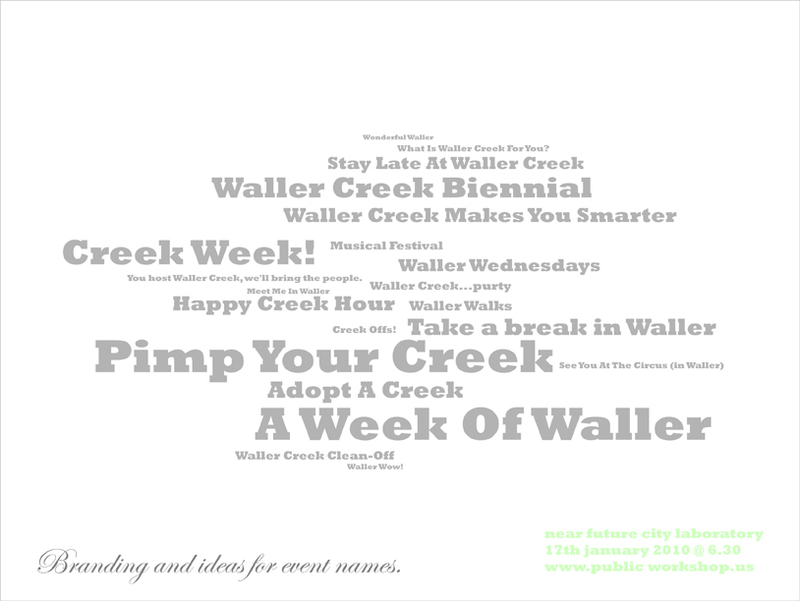 How about the 11th Annual Waller Creek Biennial? We’ll let you know shortly after we’ve fully explored the opportunity. In the meantime, feel free to take another gander at all of the great things that have happened down there so far (here). 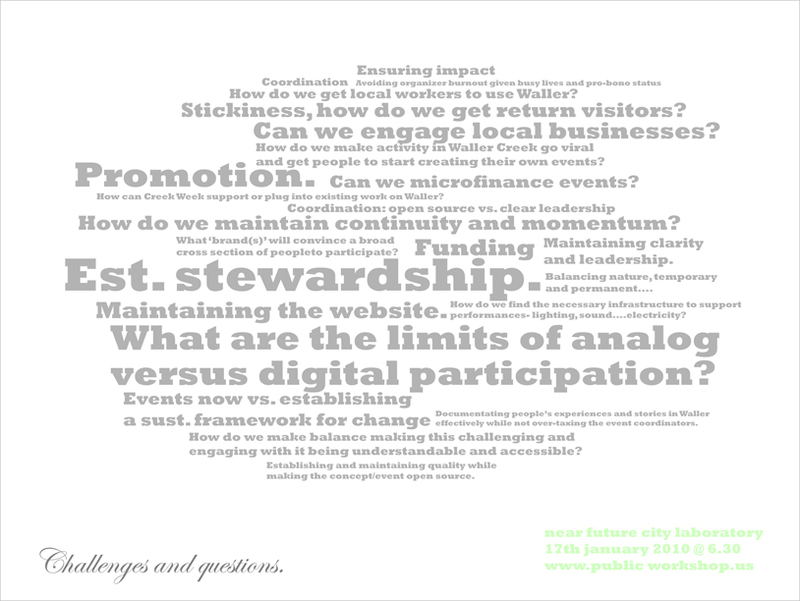 Who were the civic futurist rock-stars that made this event such a success? A very special thanks to Greg and the Hope Farmer’s Market at 5th and Waller Street in Austin for graciously letting us use their space for the event.